The Lakes of Ounianga are 18 connected lakes within the Sahara desert. They are unique as they mantain permanent freshwater in an arid region, being fed by a system of fossil ground water. The lakes are divided into two groups, 40km apart. They are the remaining part of a much larger lake that existed in this basin 5,000 - 15,000 years ago. The land area in between them is also part of the designated site. we visited this site in 2000 with a 4x4 tour from Ndjamena. On the first day you cross the Djourab Erg (wich is on the tentative list for some very important hominid sites like Toros Menalla and Koro-Toro) on the second day the car, after an interesting stop in the big oasis of Faya Largeau, has to cross mines fields from the time of libyan invasion between relics of abandoned trucks and tanks. 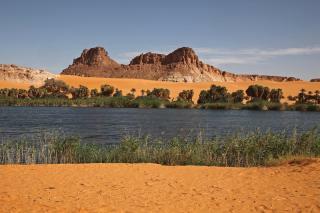 The Ounianga lakes and their surroundings offer an incredible lanscape, one of the best you can find in the Sahara. The people of the nearby villages (Tubu) approach the car but, strange for Africa, stay at a distance and lay thieir artefacts on the ground. After a long trip in the sand the cristal waters of the lakes invite you for a refreshing bath but the water is unbelively cold. The tour goes back to Ndjamena with a two or more days stop in Ennedi (another site on the tentative list for the stunning petroglyphs). Here you can also visit the impressive Archei Gorge where some Nile Crocodiles which were trapped there long time ago by the draining of Bahar El-Ghazal still survive. Isolated WHS: Roughly 1,190 KM from Gebel Barkal and the Sites of the Napatan Region (Sudan) and Sukur Cultural Landscape (Nigeria).